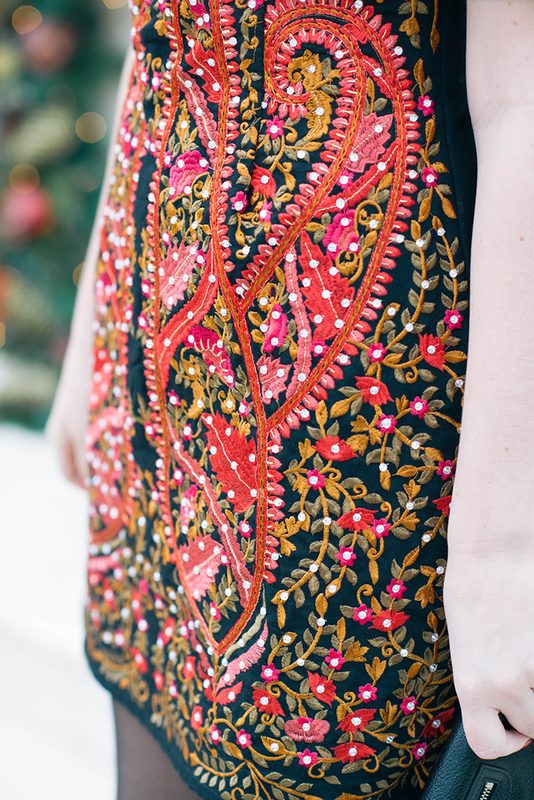 You may have seen this Dolce & Gabbana inspired ASOS frock on my Instagram more than once – it’s certainly the most festive look in my closet these days. Perfect for all of this season’s holiday parties! This dress sold out almost immediately when it first hit the site, but it’s now back in stock (and available in green!). On Thursday I attended a family friend’s Christmas fete and didn’t even have to think about what I was going to wear – this dress was an obvious choice! Although it certainly looks festive for the holidays, I plan to wear it all year to various cocktail parties and maybe even a few weddings. ASOS is a great place to find party dresses – if you’re looking for a New Year’s number, I suggest this bouncy fit-and-flare frock, this sparkling shift or this quilted metallic number. Also loving this option for more winter parties. For spring, be sure to check out this bright orange + pink mini and this textured pencil dress – so fun! 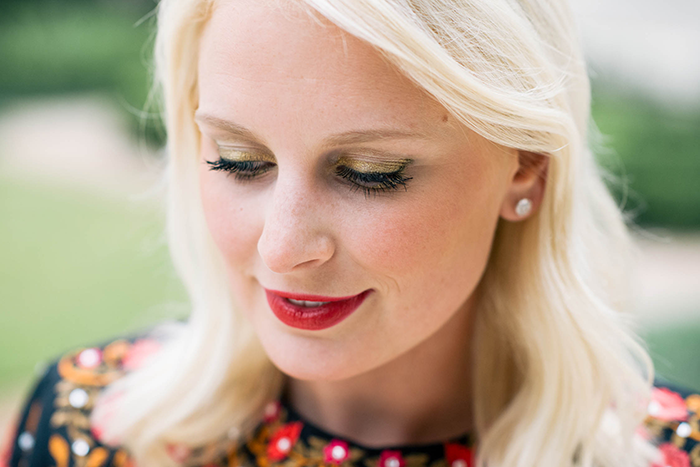 PS – don’t you just love a festive beauty look for the holidays? I had my longtime friend and talented makeup artist, Katherine Crenshaw, come over to make me look pretty for the party! 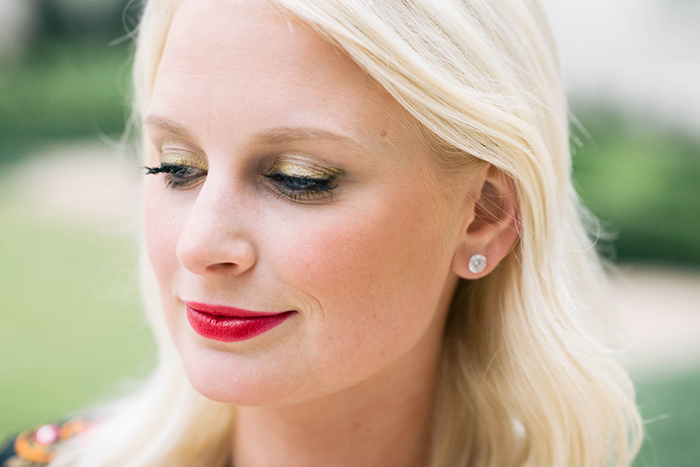 With a simple (but bold) red lip and glittering gold eyes, I was ready and out the door in minutes, thanks to K! For all of your beauty needs, big or small, contact Katherine! I love your make up. The eye shadow and lipstick are fabulous. You look stunning in that little dress, love it! Can’t believe that dress is Asos! Love this look! And that entryway is stunning, so festive! Well this is simply stunning. The dress, the scenery, YOU. Love it! Love this dress! I need to do a better job of looking at ASOS in general. They really do have some great stuff. This dress!! If I had somewhere to wear it then I would most definitely buy it! That dress is so cool and loving your lip color and all your makeup actually! 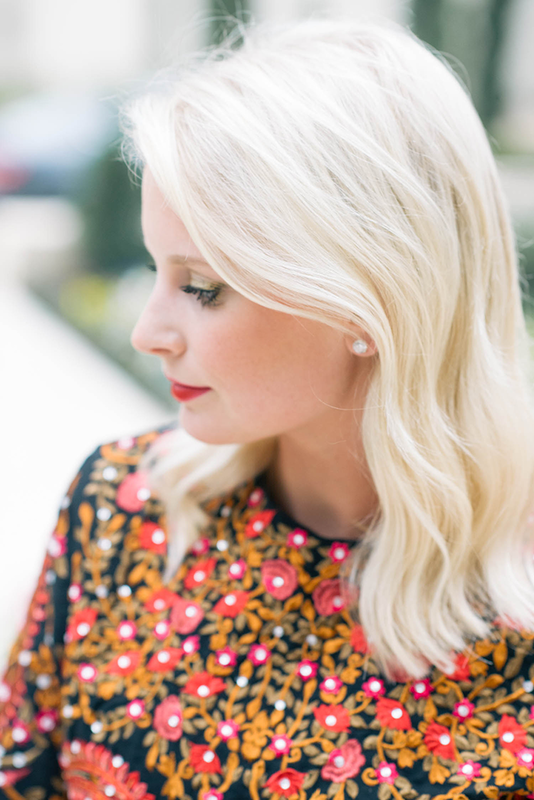 This dress is perfect for the holidays! Love ASOS! You look great in the dress! Love the eye makeup, too! Absolutely stunning dress! You look beautiful. What a great outfit for the holidays!! Loving this dress! And the Icy blonde looks killer on you! I saw this dress on your instagram and instantly fell in love. Such a statement! Happy holidays! Cute dress! I love the details. Oh my gosh what an absolutely beautiful dress!! You look stunning Merritt! GORGEOUS dress!! I love the embroidery and loving that price too! Merry Christmas Merritt! You look great! The perfect frock. this is GORGEOUS! Love the colour of the dress. This is my favorite holiday party look I’ve seen! You look stunning! This dress is absolutely stunning on you! I love your great location choices too!